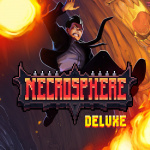 Publishing label UNTIES and indie developer Cat Nigiri have announced that Necrosphere Deluxe will soon be bringing platforming joy and inescapable anger to Nintendo Switch in equal measure. 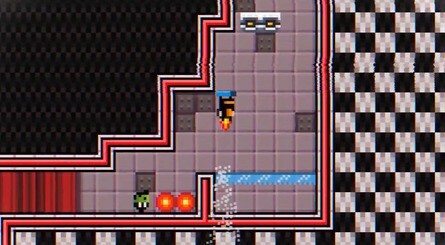 The game is described as a "retro adventure-platformer" in which players must jump and float their way across lanes of fire and over deadly spikes, bounding themselves upwards with bouncy bubbles and jetpacks. As complex as this all sounds, the entire game only ever has you using two buttons, but we still get the feeling you'll be dying more than succeeding as you make your way through this one. This Deluxe version of the game actually kicks things up a notch, too, with a whole new bonus chapter called 'Terry's Dream' being included. 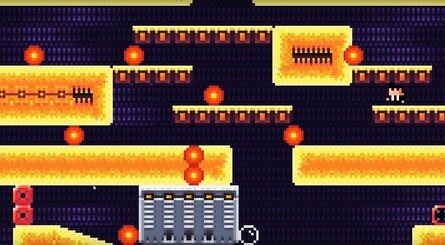 In this added level, progress is never saved, so you'll have to make it through its daunting platforming challenges without touching any of the many obstacles in your way. Good luck with that. - Innovative controls: Only two buttons! - At least 2.5 hours of tough, NO FILLER gameplay! - One big, maze-like universe! Necrosphere Deluxe is scheduled to launch on Nintendo Switch on 31st January for $7.99 / £6.49. 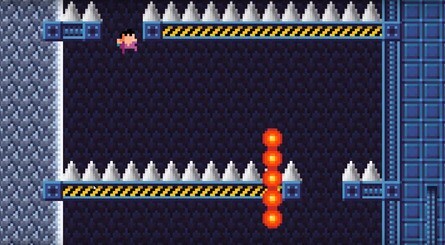 Do you like your platformers to be on the challenging side? Will you be giving this one a go later this month? Let us know with a comment. I like the aesthetic but these super challenging platformers just don't interest me. I like my games to be enjoyable these days not just stupidly hard for the sake of it. @YANDMAN This is why i couldn't get into games like Celeste. These games are genuinely good; they're just not for me. yayy, another terrible looking game (graphics wise) for Switch. Sadomachoistic platforming with pixel graphics. Where did they get that idea from? Wow. but this type of game and graphics feels like it is not quite right from my retro gaming memory. I know a lot of games look like this, but it feels like it is getting stale at this point. And ultra hard??? I will pick fun over frustrating. But I guess if frustrating is fun?? Feels like even the indies are running out of fresh ideas. Looks like any other indie platformer nowadays. Yaaaawn. Note really a style I will enjoy. Graphics are a little too retro. It's short and sweet, with super peppy tunes and bright visuals. And it's difficult, but in just the right way. Not the "haha, made you waste your time" kind of stupid hard. It's always fair and gives you a sense of accomplishment. If you guys enjoyed VVVVVV, chances are you'll like this too. It has its own twist going on, just like Terry Cavanagh's epic C64 homage. Its difficulty derives mainly from the twist supplied by the two-buttons-only controls, that keep getting tricky layers added as you find your upgrades. And just like in VVVVVV, dying won't ever punish you very hard. I never said I enjoy VVVVVV. Okay. But then to answer your actual question; no. It's not that much like VVVVVV. 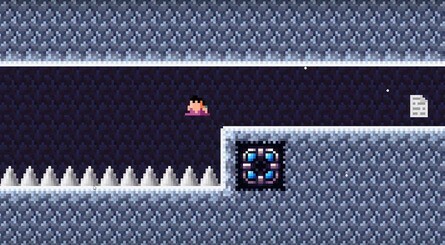 It's shorter, harder, more linear, and has Metroid style upgrades that open new areas and make traversing the world gradually easier and faster. This isn't retro. It's just Pixel art indie. This game had an SNES color pallette and Atari 2600 graphics. I love retro indie games. Look at Joy Masher. That is what retro games look like. This is just lazy. Put the work in to get a retro feel. @Hikingguy it's not about running out of ideas it's about not forming any. This is just a clone of many other games. I design games all the time and the one thing to me that is importatnt is doing something original. I lkiterally don't undersatnd why you would want to spend a lot of your time and effort making something that somebody else already has done. Unless you are going to mimic a classic arcade style but utilise modern abilities say by making an incredible beat-em-up or shooter which can still be very original i just don't see the point. "Pixel art indie" That is it! I could not quite put my finger on what this was but I knew it was not retro. Or at least not any retro I am familiar with. I do not really want to knock the game as I have not played it, but their list of "Game Features" reads like a standard list of games I played many times.